IBM i systems are still the workhorse of many enterprises today. They contain tremendous amounts of critical data essential to running the business. But with aging systems come challenges: difficulty finding skilled professionals; hard-to-maintain aplications because of risks associated to change ("What happens if I remove this brick? "); tough onboarding of new employees because of green screens ("Where's the mouse?! "); operational inefficiencies - growing maintenance costs, integration challenges and more. At Fresche, IBM i management and modernization is what we do. We are on a mission to help IBM i customers benefit from everything that modern technology has to offer. 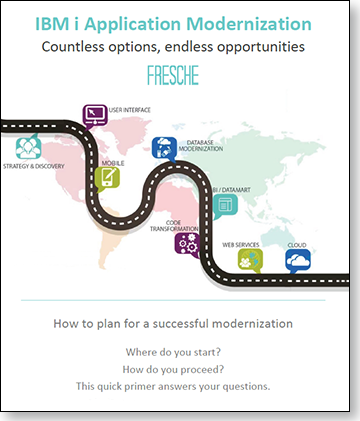 Because the first step to modernization is building a plan, we thought you might like to read this white paper and start thinking about how modernization can help your company. that matches your technical and business needs!